We do take pride in our alumni. They have become well-known political and public figures, decision-makers, researchers, journalists, sociologists, lawyers, and economists. 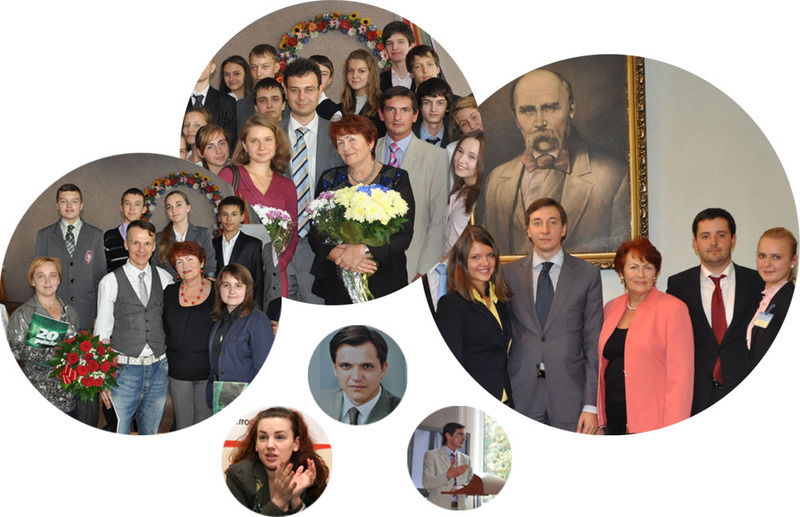 Yuri Pavlenko joined the governing élite as Minister for Family, Youth and Sport (2007-2010), Ombudsman for Children under the President of Ukraine (2011-2014), he is also member of the Lyceum’s Trusteeship Board; Lesya Orobets is Member of the Verkhovna Rada, the Ukrainian Parliament. The Lyceum boasts its alumni who became researchers: 28-year old Doctor of Sciences Andriy Haydutsky; Associate Professor, Danylo Hetmantsev, PhD in Legal Sciences, who works at Taras Shevchenko National University of Kyiv, teaching Civil Law; his colleague Olga Sovhyria, PhD in Legal Sciences, who teaches Constitutional Law; Oleksandr Dykiy, PhD in International Economics, works at the Institute of International Relations. We are also proud of Lesya Matviychuk, she is a human rights activist. The group of our former students who are in the media is very populous. A whole crowd of popular TV journalists, anchors and hosts, such as Lydia Taran, Natalka Fitsych, Maxim Butkevych, Maxim Drobok, Olena Koshil, Yulia Mykytenko, Olga Hodovanets, and Oleksandr Vlasenko graduated from our Lyceum. On the air we can hear the voices that are so dear to us, the voices of Oksana Vashchenko, Serhiy Ananov, Natalka Nedilko, and Vira Pertsova. We find the names of prolific journalists Natalka Paliy and Olga Vasylchenko in newspapers which they make. We are glad that they have found their vocation and enjoy their work. We are following their flight. And we are happy because they like the Lyceum and remember about the Lyceum.